It has been at least two years of work to get plants in the soil of my raised garden beds. My big obstacle this year was to get some kind of fencing in place to keep out the little critters like rabbits and porcupines. I wanted to make "moveable" fence sections so I didn't loose the benefit of being able to work more easily around the raised beds. I used electrical pvc pipes to hold my fencing in place which makes it light enough in weight for me to lift up the sections as needed. So far my little creation is working. In my perennial bed I had a guest too large to keep out fencing. A little hard to see but there is a set of large moose prints. He didn't eat anything on his way through the garden bed. Hubby just happened to catch a photo of this guy along a road near our home. He could have been my visitor. My summer rock gym was delivered yesterday. My first load of rock for the summer, 12,000 pounds of boulders. Hoping to make a big dent in landscaping the front of my house. We are having the gloomiest May weather. Thank goodness I am a quilter and have plenty of projects in my studio to keep me busy. I did swap the position of the row once I toned down the background pieces behind the fish. I liked the kit on the wall in the store but in my sewing room it looked so wild. Just went with blue batiks to create the motion of the water and the bubbles. The Eskimo ladies need some ric rac on their parkas but I have to make a trip to the store to get that. These three kits below are all from the Kenai Fabric Store. They were designed by Dana Michelle. I hope she does their designs for a few more seasons so I can get a nice grouping of her work. My only reservation is the tiny pieces of silhouetted shapes. Impossible to stitch down but I will just use them as a guide for decorative stitching...that is my plan anyway! Next big project is getting ready for Breakfast Club this upcoming Thursday. I need to cut out my pieces. The solid color batiks will be the little triangles with just two fabrics alternating in the large jewel shapes. I am pulling from my stash. No new fabric. I'm very proud of myself. We'll see how long I can hold out on buying new fabric. 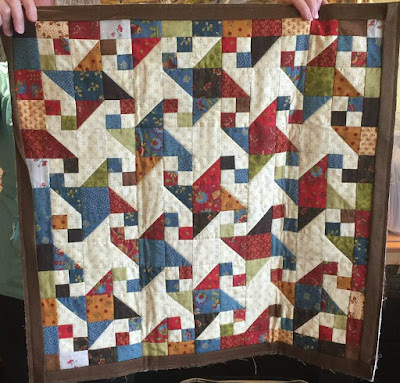 In the process of cleaning off my cutting table and putting things away...I found four orphan "Delectable Mountain," blocks and remembered I had made some blocks with mini half square triangles left over from the big project. Here they are...all reunited. I think I can make a cute little quilt with these parts. 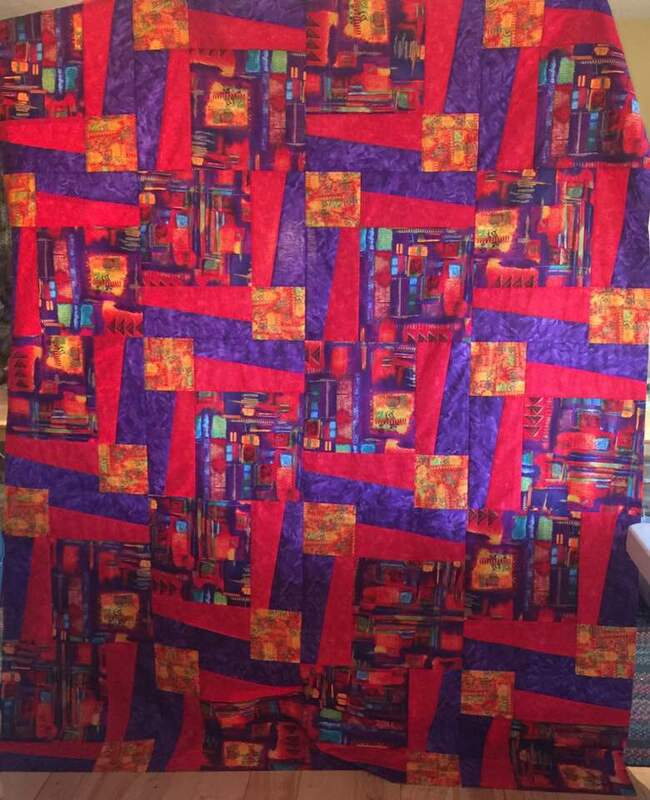 I even found the background fabrics in my scrap stash. Is it really possible I will make two new quilts without buying any new fabric? It could happen! I mentioned in a previous post I was tackling, "Row X Row," projects at retreat. This will help me limit my kit purchases this summer as I find there are a few designers I prefer. I got five kits mostly completed at retreat. 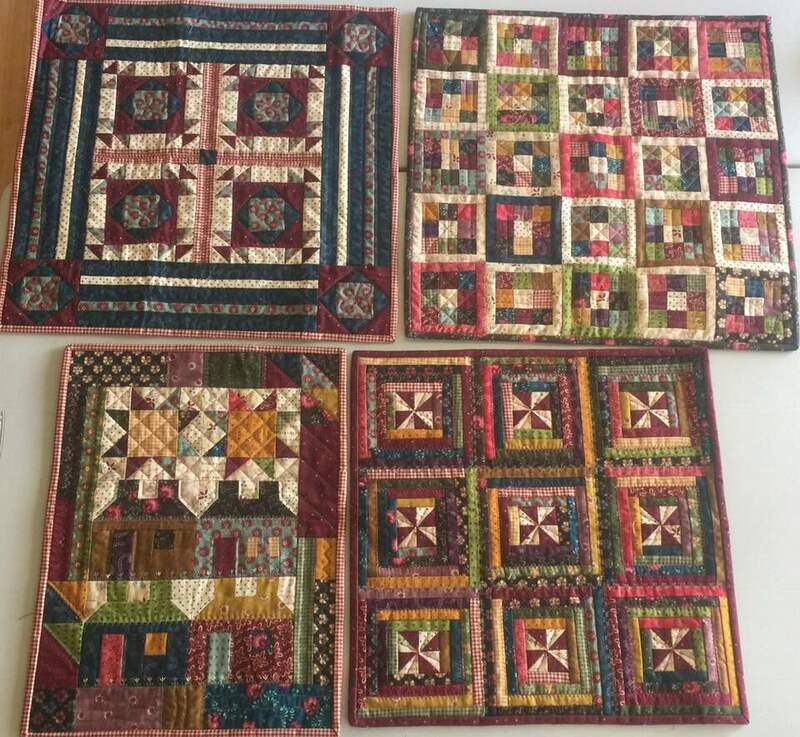 The three top horizontal designs are Marie Noah's from the quilt shop Northern Threads in Fairbanks. 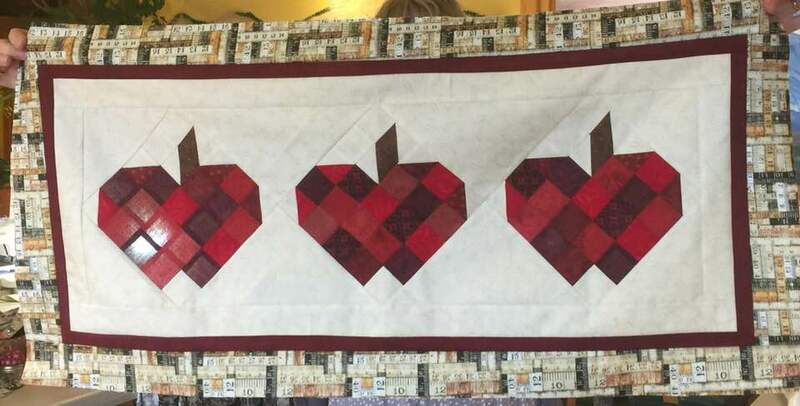 The side and bottom designs are from Diana Bradley and her quilt shop Quilt Zone in Anchorage. Diana always has a unique way for piecing. 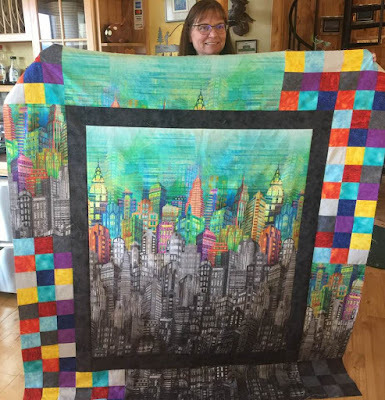 Both of her designs were rather challenging with paper piecing and creating templates to position on fabrics directionally for mountains and northern lights. 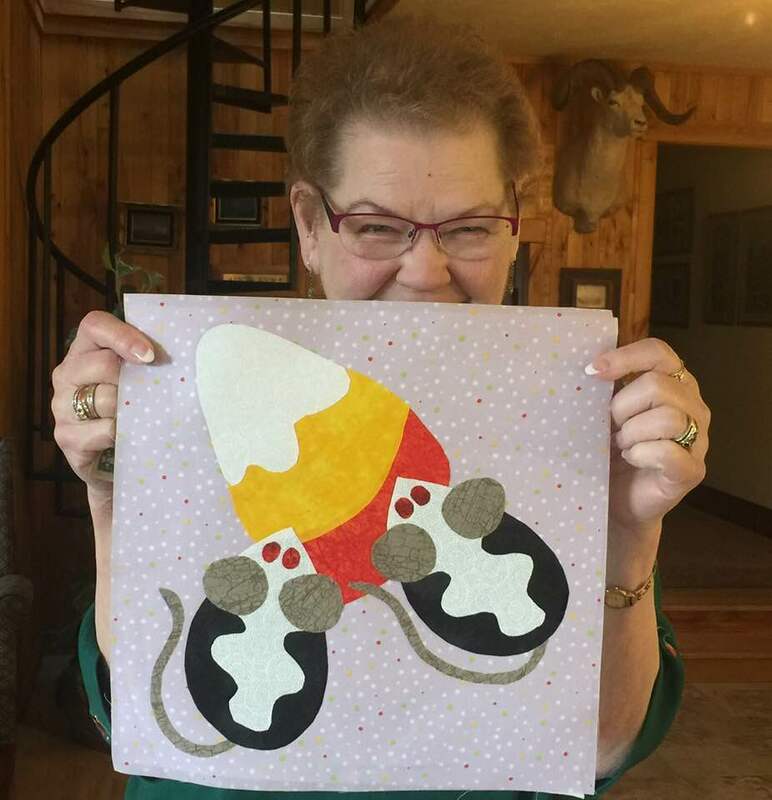 This weekend I worked on five more kits, all by the Alaska designer D.J. Robidou. 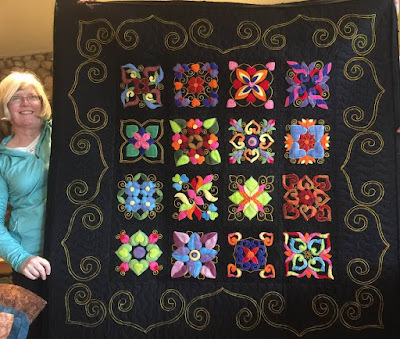 Her designs are from Abby's Reflections in Sitka and Rushin' Tailor's in Skagway. 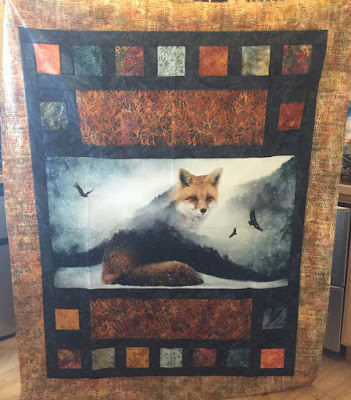 I have kits from three more Alaska quilt artists I am going to focus on finishing. Spring is a long time coming this year. We are still getting new snow on the mountains every now and then but the leaves on the trees are finally popping open. At the base of the mountains is Eagle River. We've had a bit of gloomy weather. I don't know the name for this weather phenomenon but it happens every now and then. My hand is covering the sun so I could attempt a photo. There was a ring of light that was sometimes a rainbow, around the sun with two "suns" on the sides of the circle. The bears are getting pretty active with several black bear sightings on our mountain. So far I haven't seen them in my yard. I really need to start taking a gun when we go for our walks...just one of those habits I need to get doing again. A rare moment when Logan and McKinley stopped to listen to me. 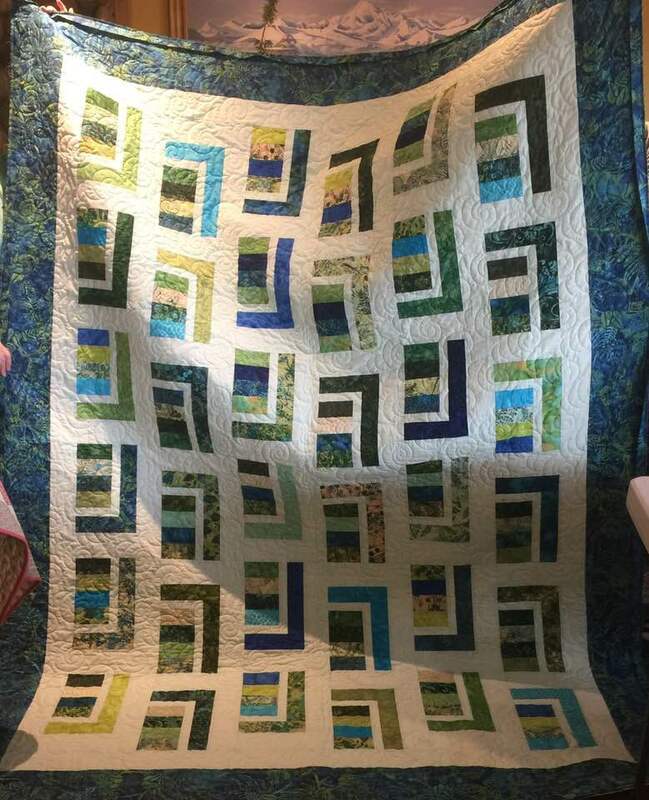 We had 13 quilters at retreat. 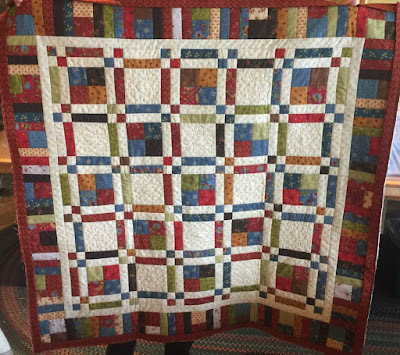 Here are most of the show and tell quilts plus projects that were worked on at retreat. Since I was the photographer...my quilt projects from retreat at missing but I will cover those in a separate post. The first two photos are from Joyce who loves to make little quilts. She has been the main person to inspire me to go small. 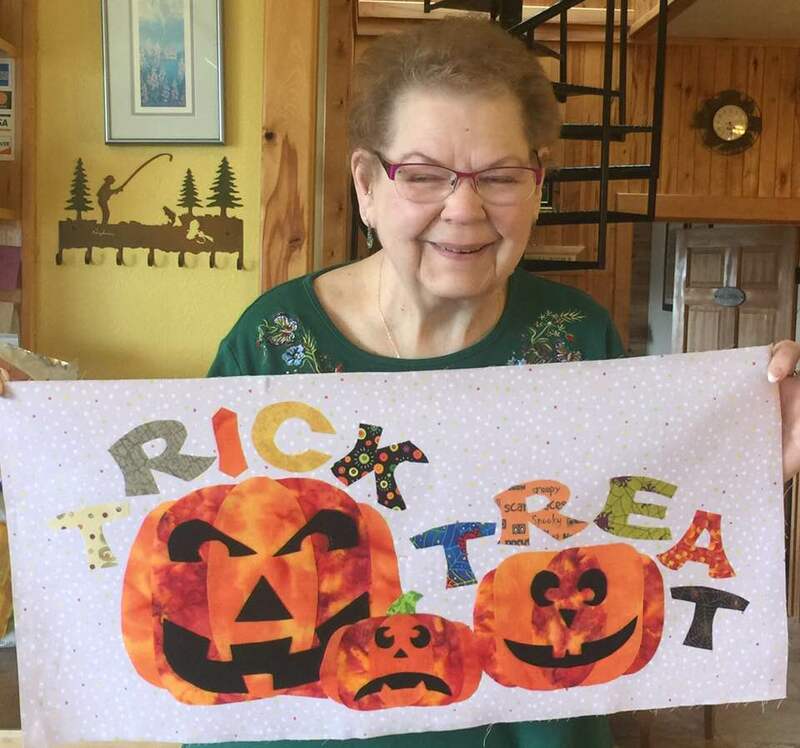 All of Joyce's little quilts were from the monthly program designed by Kim Diehl called the Whatnot Club. The next two are from Jill. 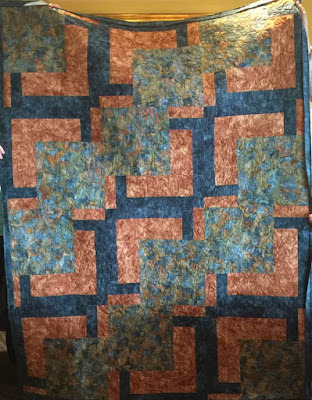 This scrap-tastic quilt is queen-sized with over 2,000, 2-inch squares. 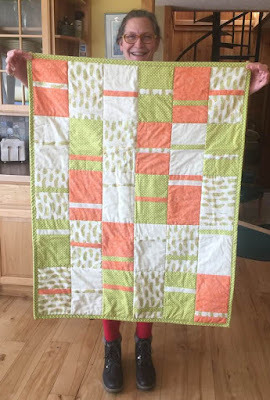 She thought this project would really bust her scrap stash but she just made a little dent in the pile. And here is Jill with a quilt she was making for her son who is graduating with a degree in architecture. Sew perfect. Jan is our most senior member of the group and is Jill's mother. She worked on a new Halloween quilt. Jan really liked those red, demonic eyes she gave the mice. Kathy brought finished two quilt tops, this colorful Maple Island BQ3. Unfortunately I didn't make a note of the pattern for Kathy's second quilt top. Kaye brought several runners to finish up. She sells quilts at a couple of Christmas bazaars every year. Looks like runners are popular in her booth. 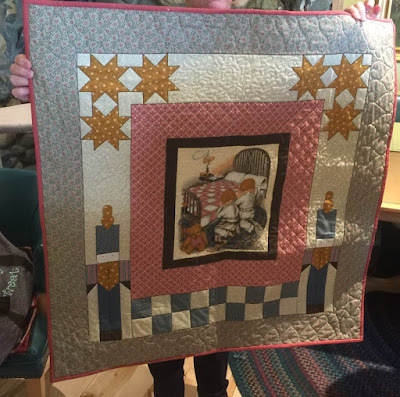 Marcia brought a second panel quilt for show and tell. This is the pattern, "Bricks," designed to work with panels. Marcia is the leader of Breakfast Club and she was working with a new set of floral panels by Teresa Ascone and made two quilt tops at retreat. Both are stunning. The second version with the floral panels. 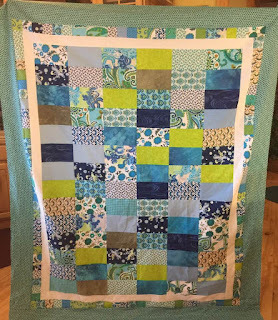 And Marcia brought a mini quilt kit for all of us using an Alaska motive fabric as the center of and octagon. I need to piece mine before Breakfast Club next week. Mary gets so much done at every retreat even though she usually is the last to arrive and the first to leave. 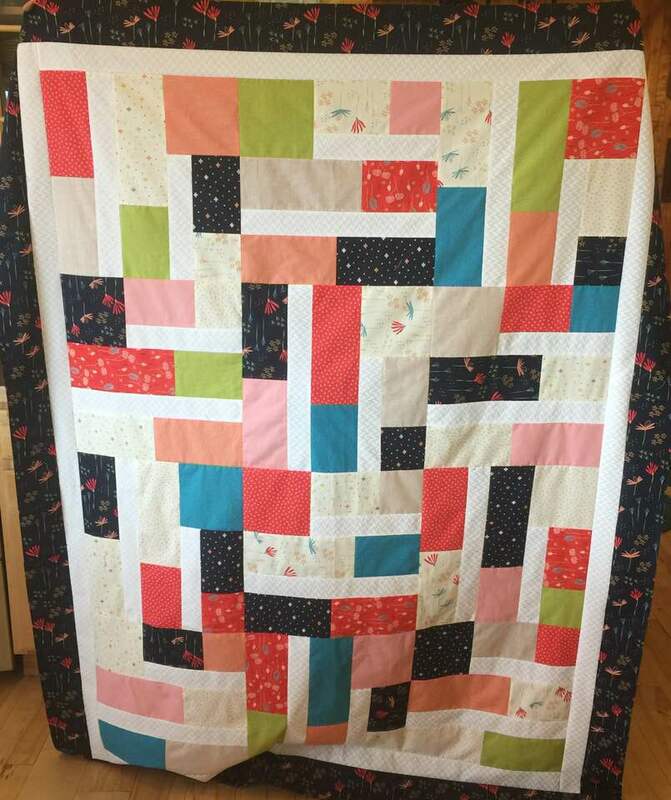 She pieced, quilted and bound this quilt her first day. 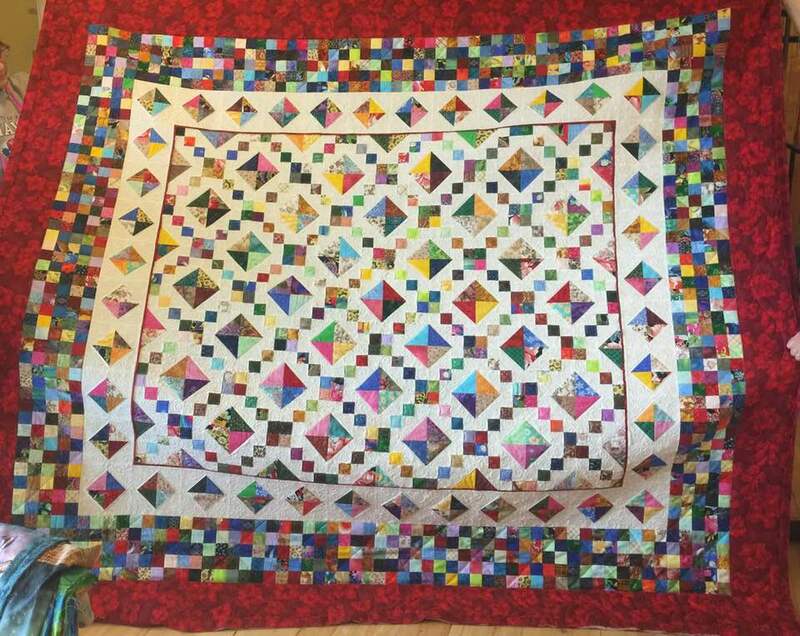 This quilt top got pieced by Mary the second day. 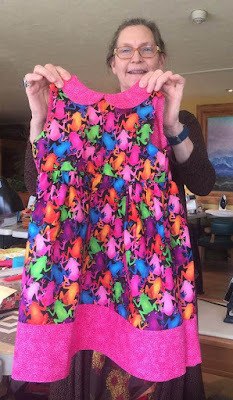 And she also made this adorable dress for her granddaughter. 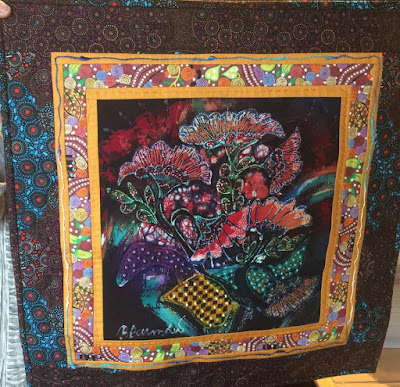 Sandy brought a suitcase of quilts that needed binding...enjoy her "trunk show." And here is a flimsy she worked on after getting all the machine stitching done on all the quilts needing binding. 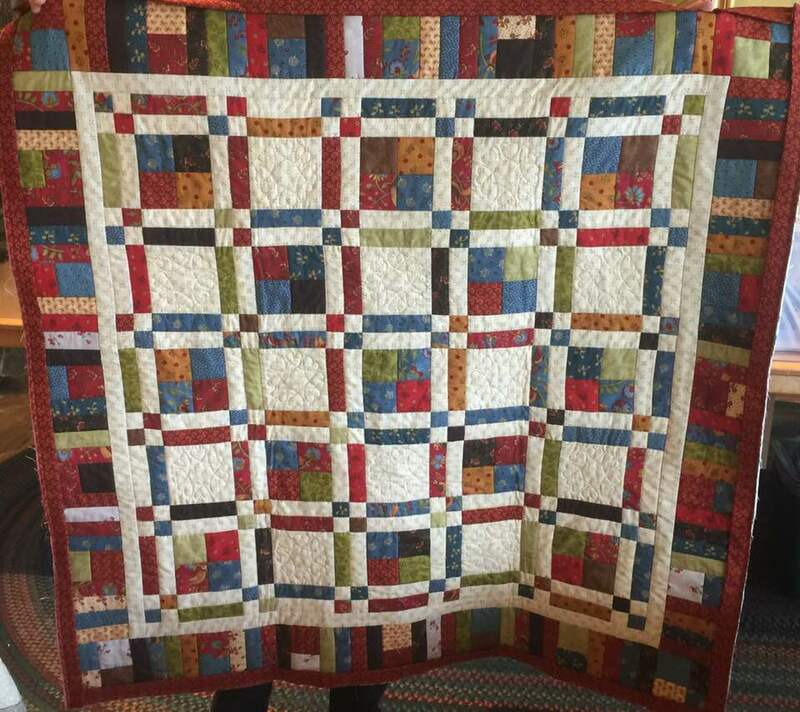 Lots of great quilting in our group. I belong to a quilt group, "Material Girls." We have three retreats every year at a great Bed and Breakfast in Wasilla. Sometimes the weather cooperates and we get this beautiful view while we are stitching. The white dots in the photo above are lights reflecting off the glass of the window. 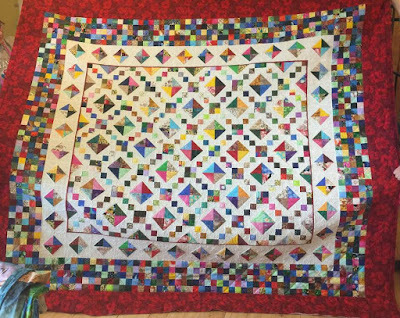 At our quilt retreat in May of 2017 a challenge was agreed upon...make something "quilty," with a panel and have it completed by May of 2018. Here is the reveal of our projects. 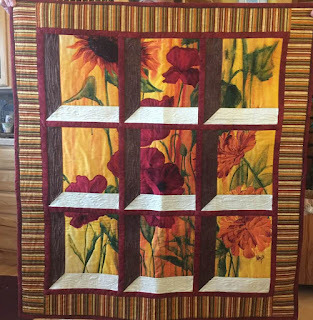 The quilt below is one panel...not just the center. We were all fooled into thinking just the center picture was the panel and everything else was pieced. Here's a beautiful art panel. The photo doesn't capture all the beading and embroidery stitching that was added to the piece. A fun panel series of wildlife. This is a commercial pattern, "Stepping Up." Not the best lighting for quilt photos. 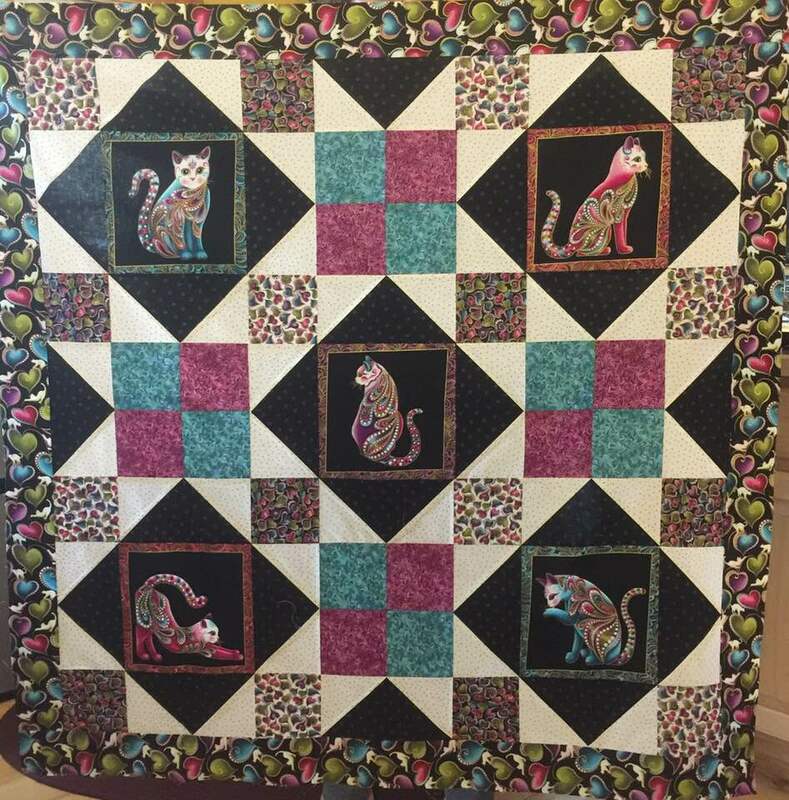 The cats in this panel quilt as so much more colorful in person. The center, "Alaska," panel is by Teresa Ascone. 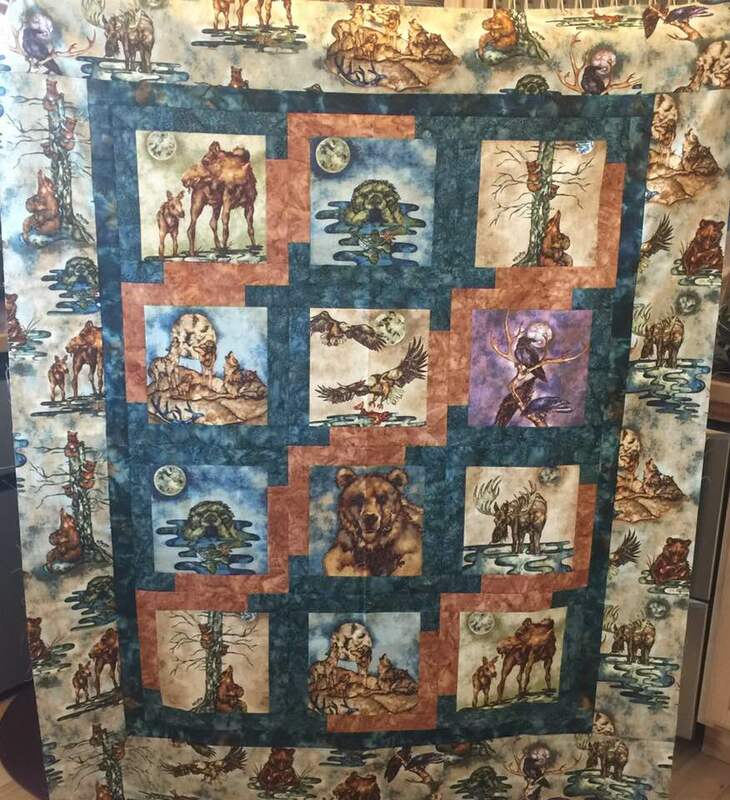 She is a popular Alaskan artist whose work as been reproduced on fabric. Next is a series of Hoffman panels with original design blocks added. 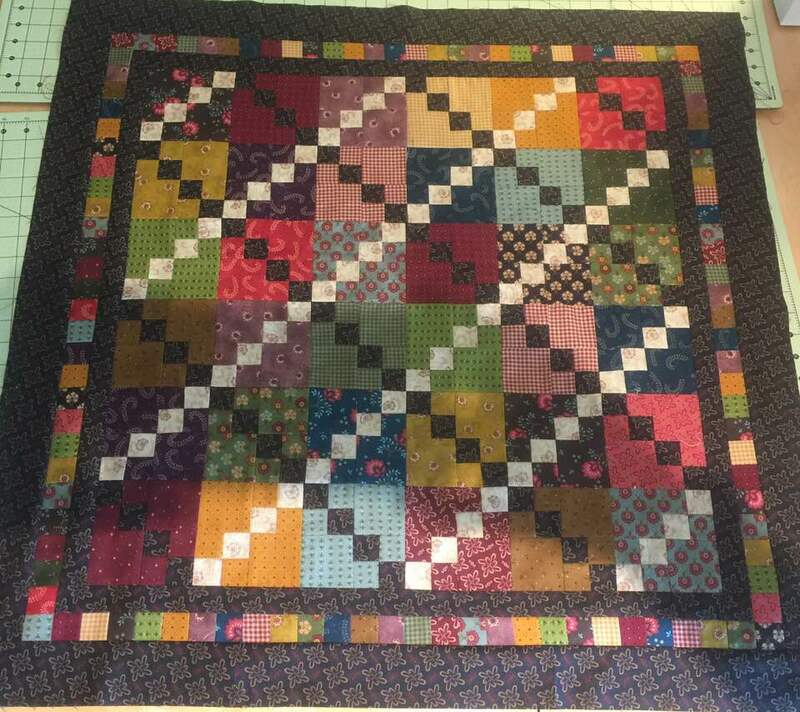 Just needs quilting. Below is another Teresa Ascone panel, framed by Kaye. Yes, another Teresa Ascone panel. 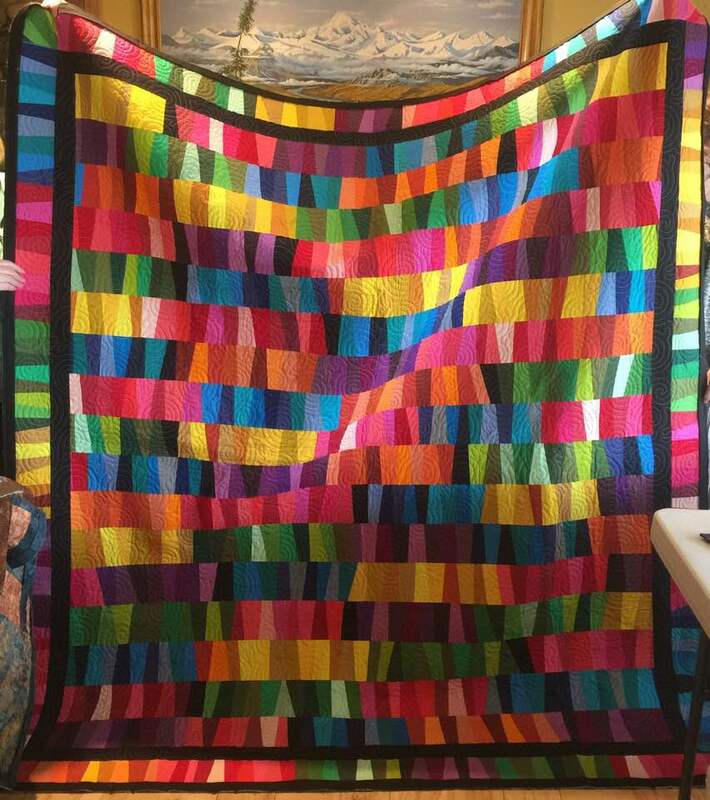 This was given an embellishment of fireweed in wool. An attic window treatment. 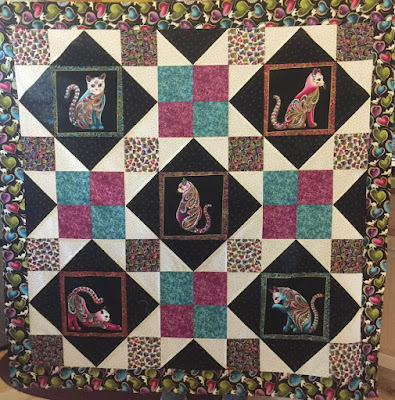 The maker of this, Mindy, also added a flanged binding. 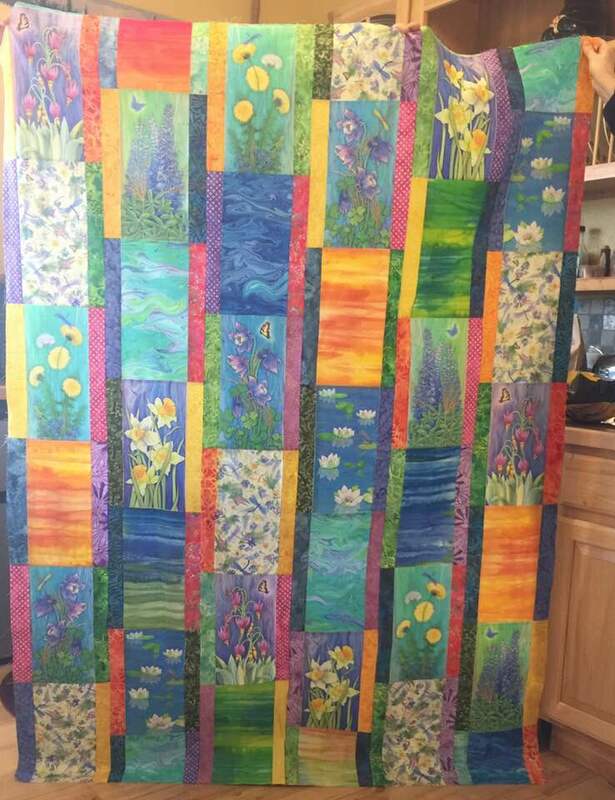 And my Hawaiian applique panels. 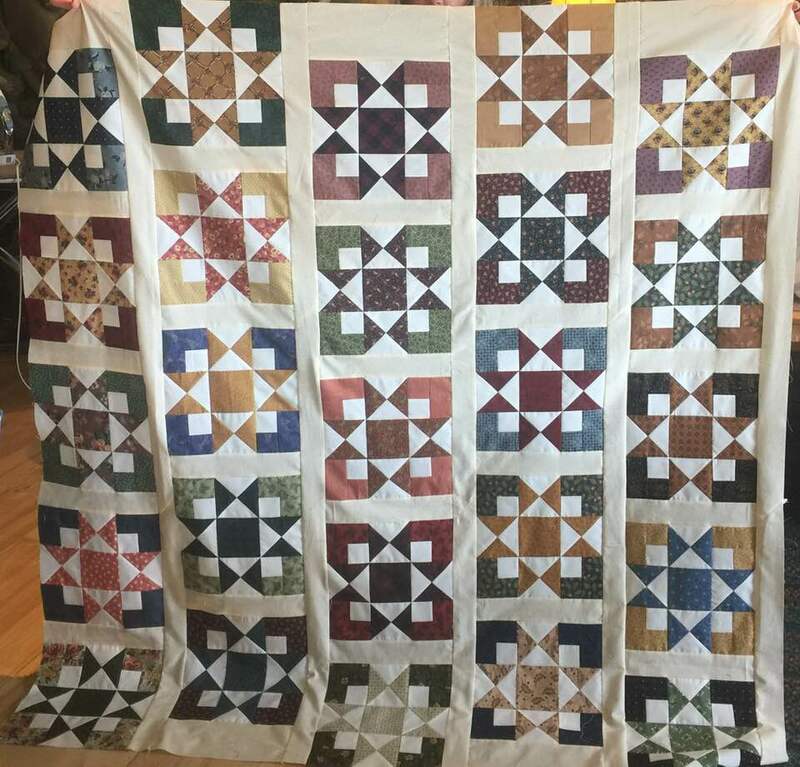 I will have more to share about my quilt later. I'm planning another post with the projects made at the retreat, plus show and tell.